GPS NAVIGATOR Delta 80 The main features of the Delta 80 computer include: large 8.4" color display, wide and handy keyboard, shape designed to guarantee maximum ergonomics and possibility to connect to data networks (integrated Wi-Fi, Ethernet port, 3G quad-band modem) anywhere and at any time. 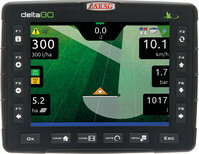 The version with built-in 3G modem allows user to communicate with a fixed station using a mobile telephone network, to: Receive the RTK differential correction data; Output and receive data relevant to spraying treatments; Analyze and resolve problems remotely thanks to specialized Arag personnel. Monitor Bravo 400S Designed to feature the accuracyrequired by the Seletron technology,Bravo 400S can now be adjusted tosuit all field applications, if matched tothe proper electronic control, sensors,actuators and accessories. 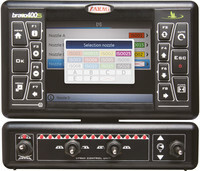 It can beused as navigator and as computer forthe management of all crop sprayingmachine settings. Monitor Ninja It is developed for spraying on turf sport pitches (golf, football, etc. ), where it is necessary to use smaller size machines without cabin. 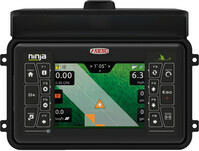 The Ninja computer provides a compact and completely watertight solution, suitable for bad weather conditions. Furthermore, it is equipped with a sun visor that, once closed, offers further protection to the display and keyboard against accidental impacts or exposure to weather conditions. Navigator LT NavigatorLT is a guidance monitor with integrated GPS receiver. The Arag Navigation Software makes it possible to maintain a user interface that is the same as Arag monitors.